This is too cute, Christina!!! Love how you colored "Sean O'Hare"! How Cute is that! Great job on the coloring. Ooh lucky you - enjoy the warm weather:) He is too cute too! OMG!! Love this one!!! Way to go! Have a fantabulous trip!!! Wow! I love your coloring! Wonderful job! 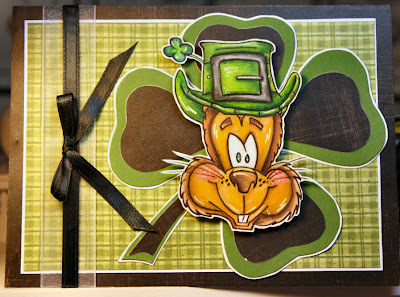 Awesome card and a stunning job coloring your images!! Sean O'Hare is amazingly done! Your coloring is spectacular! Love the large shamrock behind him! You did an outstanding job!